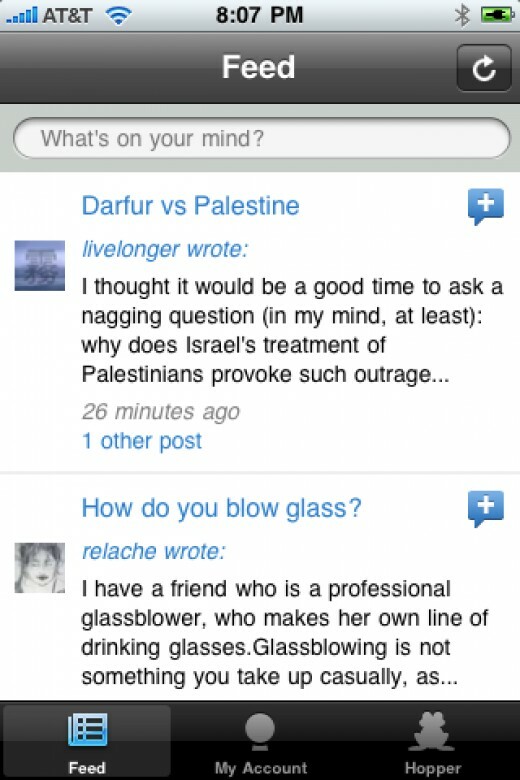 I’ve noticed a common pattern amongst HubPages users- they typically join with one motive in mind (e.g. earning money or finding a creative outlet), but find that HubPages is full of hidden surprises. Many comment on the unexpected value of the HubPages community, and others have been surprised by how HubPages has allowed them to hone their writing and develop a voice they never thought they had. Hubber cjv123 found something altogether different- press coverage! Not too long ago, a producer from Fox News found cjv123’s writing on HubPages and emailed her about doing an interview. cjv123 was kind enough to share her interview process (My Fox News Interview and HubPages) as well as her thoughts on the interview itself (My Fox News Interview Video). 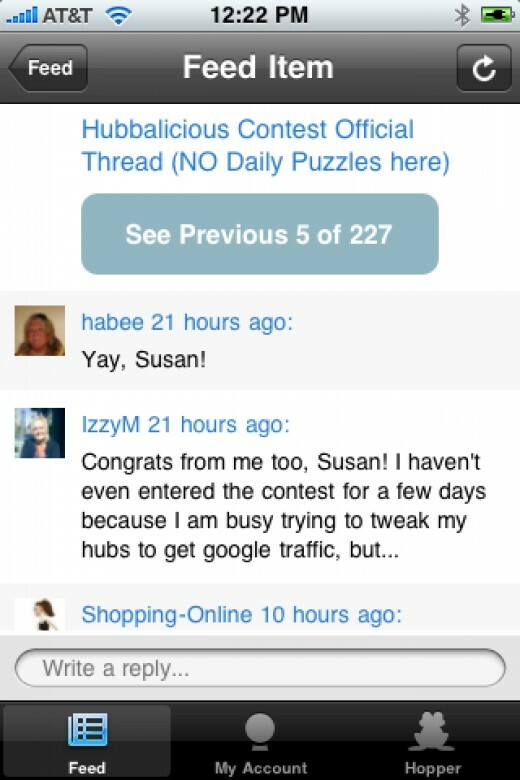 Lucky for us, she was also willing to answer some questions on her overall experience of being discovered on HubPags! 1. Now that some days have passed since the interview and your initial reactions, what are your thoughts of the whole experience? As a writer, you’re always hoping someone, somewhere out there is reading what you write on-line. I’m still tickled when someone does read what I write and very grateful when they take the time to read my Hubs and no less leave comments. I never (honestly) dreamed Fox News or any producer from any news organization would be reading my Hubs. Despite the fact that I know Hubpages turns up on most all the major searches if you use the proper tags. 2. What originally inspired you to join HubPages? What did you hope to get out of the experience? 3. When you started writing on HubPages, did you ever anticipate hearing from the media or get any particular attention? Absolutely not. I honestly looked at others who had achieved Hubpages success and was happy for them never dreaming it would or could happen to me. However, if it ultimately will help sell my book(s) then I’m all about getting my Hubs noticed! 4. Why do you think that the producers at Fox News chose you as an interview subject? Thanks to Hubpages – I had written about the right topic at the right time regarding the War on Terror and because of my Hubs turning up on search engines – a Fox news producer stumbled on them. I make it clear in my “about me” page who I am and what I’m about and they just happened to be looking for a point of view from both a military wife and military mom. 5. Would you like to get more media coverage in the future? Honestly? 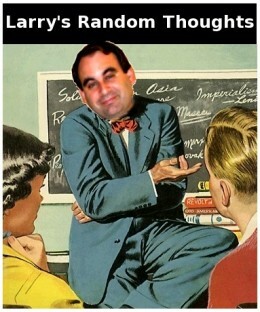 Not really – however – if the publisher who has my manuscript publishes the book, you betcha! Part of the obligation you go into when you publish a book is – as an author, I promise I will try my absolute best to make sure my book sells. You give your word so of course in that case, yes, I’d seek the media attention. Otherwise – I honestly do not wish for it. I work for a celebrity and I can not tell you how many times, standing in the sidelines I’ve watched all the attention he gets and think, “Thank God that’s him and not me.” Not that I’m shy, but it truly is a lot of work to be “on” and all the demands made upon you and your life. So I do not envy nor covet that attention. 6. What advice would you give to other Hubbers who would like to be ‘discovered’ on HubPages- for news interviews, perhaps, but also for networking, finding a job, getting published, etc.? Well, I would say read all that you can about how to get your Hubs noticed. Read other Hubs about this very thing as well. That’s how I started. One key thing I can’t say enough is TAG WORDS. That is so important if one wishes to be read beyond their own Hubpages social circle. Plus, really think through your titles. Don’t just slap some words up there. Try to think of something in your subject matter that would make you notice an article if you did a search and think, “Hmmm, now that one sounds intriguing.” Your title is important. Another important thing is be careful about your grammar and punctuation. Check and recheck your spelling. These key elements seem to be a lost art these days, but an incoherent, poorly written Hub won’t get the attention it deserves even if the content is amazing. If an agent is perusing the internet and they come upon two Hubs, one with proper spelling and grammar usage, and one on the same topic sloppily written, it’s no contest. Take the time to check and recheck your work for mistakes. I think this really goes a long way no matter who you wish would notice your writing. Then Tweet, link your Hubs on Facebook etc. and keep on Hubbing! …and only you have the power to bring a brighter dawn! Ok, that’s a little dramatic, and yes, it even rhymes. You might even call it a great example of bad writing, which is precisely why it’s a perfect way to direct your attention to the Dark And Stormy Night Finalists in need of your votes! For those of you who missed the submissions round, this blog post will give you an idea of exactly what the contest is. In a nutshell, the idea is to try to write the worst opening line to a novel that you can imagine. We got a lot of amazingly bad entries, which made sorting through and picking the finalists a very difficult (but hilarious) job. In the end, the HubTeam narrowed it down to just ten, and now it’s up to you to pick the over all winner! So head on over to the official voting hub and cast your ballots. We want lmmartin to keep her hair… or at least have pulled it out for a reason. I remember when I first started using the web in the early 90’s. Web sites were quite ugly with blinking text, slapped together images, and unstyled text. But in those days, we weren’t too bothered by that. There was an excitement about the possibilities of all the information that could soon be available on the web. With the slowness of modem connections at the time, I thought that article-based web sites (or online magazines as I would have said then) was where the action was going to be. I guess looking back, I was pretty naive not to see that broadband was inevitable and the web was not going to be a great repository of articles but an active social network. I had thought that urls were too nerdy and would prevent nontechnical folks from using the internet directly rather than going through a more user-friendly website such as AOL or at the time, Prodigy. I wasn’t completely wrong about the impact of article-based web sites. The print media today seems close to extinction unless it can reinvent itself online. Some video still has to be complex to be valuable, but the logic of the old media ecosystem, where video had to be complex simply to be video, is broken. Expensive bits of video made in complex ways now compete with cheap bits made in simple ways. “Charlie Bit My Finger” was made by amateurs, in one take, with a lousy camera. No professionals were involved in selecting or editing or distributing it. Not one dime changed hands anywhere between creator, host, and viewers. A world where that is the kind of thing that just happens from time to time is a world where complexity is neither an absolute requirement nor an automatic advantage. Wikipedia has demonstrated the force that article-based web sites can have. It has also demonstrated the power of crowdsourcing as an important source of content creation. Recently, Huffington Post has been attracting lots of attention as it has risen rapidly in traffic and readership. Nothing to my mind speaks better to the changing state of the print media than a list of the top article-based sites. The list below is based on US unique visitors as estimated by Quantcast. I am also excluding sites that do not focus primarily on articles such as Facebook, Yahoo, Google, AOL, and Microsoft. A list like this is a bit deceiving. NYT owns about.com, Associated Content is owned by Yahoo, and Blogger consists of both Blogspot (for readers) and Blogger (for writers). It also doesn’t tell you which sites are on the rise, on the decline, or staying roughly in the same spot. Still, it is very interesting to note the new names that are appearing along side the New York Times, Washington Post, BBC, People, and CNN. 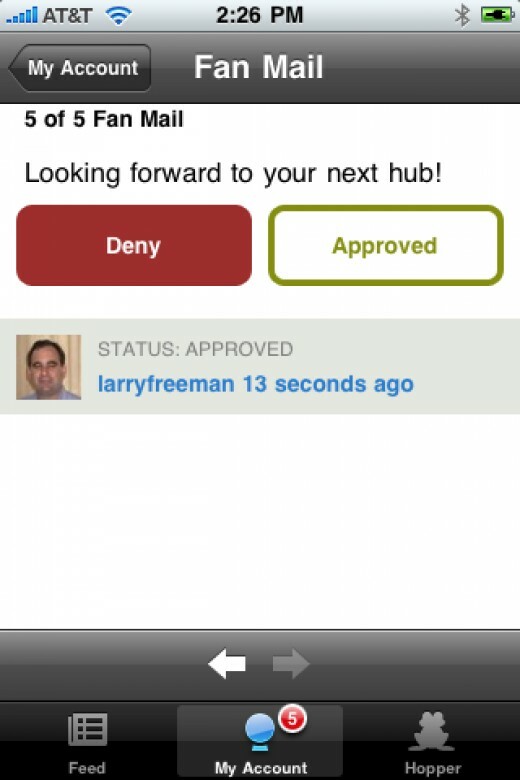 Last week, we introduced the new HubPages mobile app for the iPhone. We had announced that this was coming 4 months ago so it was very nice to see it made available. I thought that it would be useful to provide a walk through of the current features and list out what’s coming next. To use the application, you will either need to have a HubPages account or you will need to sign up for one. The application is free. To sign up from the application, just click the “join” button at the top right. 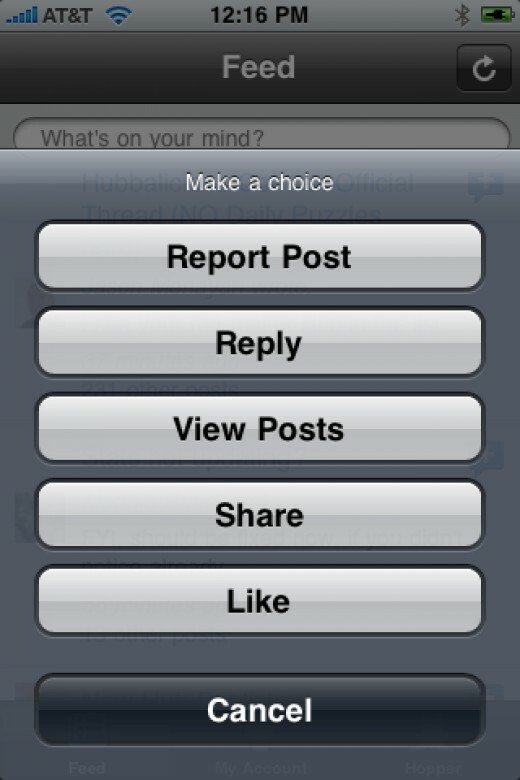 Feed: a mobile version of the HubFeed. My Account: stats and ability to moderate comments, fan mail, and requests. 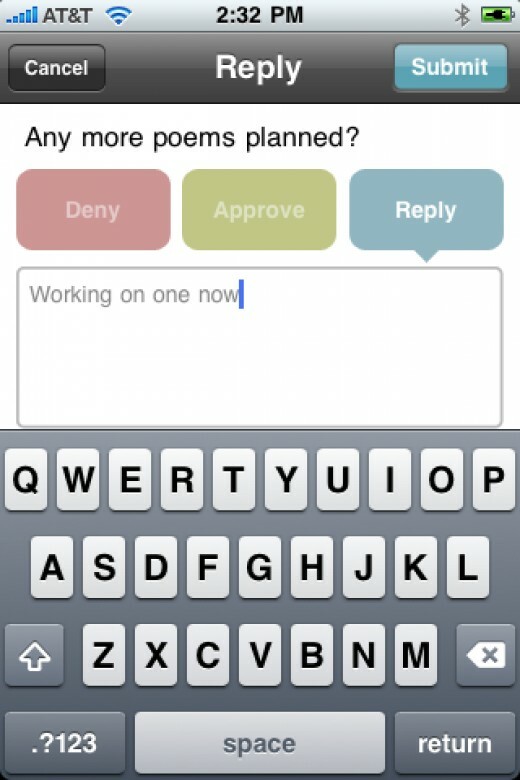 Hopper: a mobile version of Hub Hopper. To switch between any of these features, just click on the tab button. 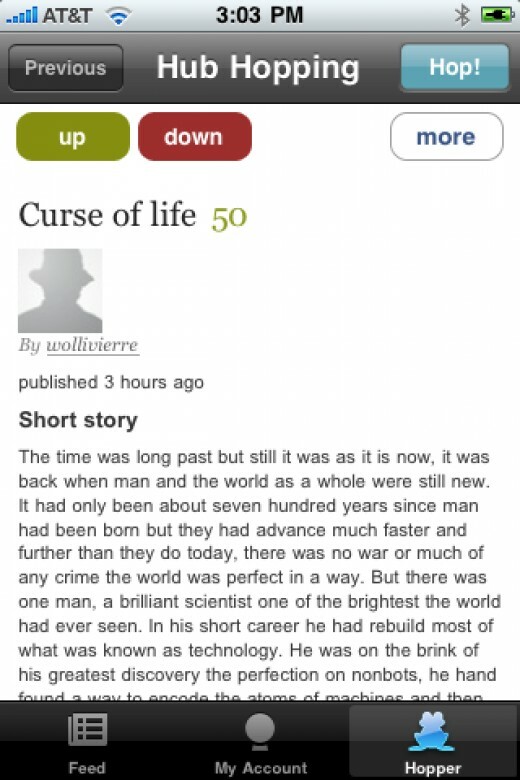 The application starts up displaying the mobile feed. 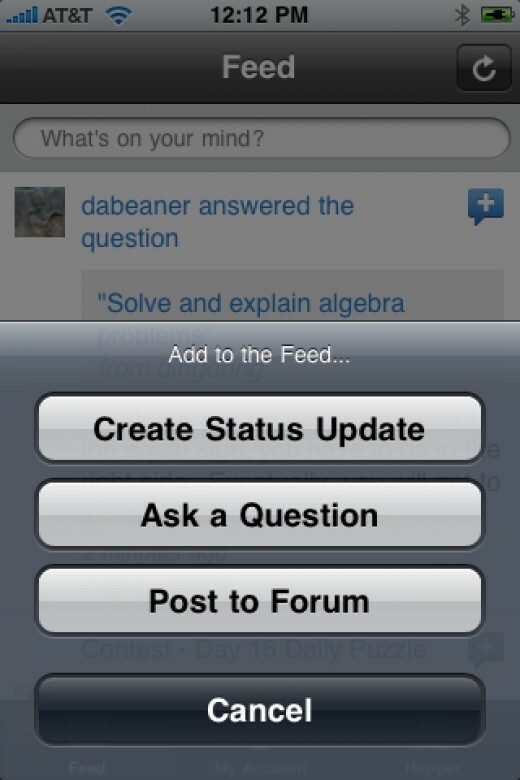 For each feed item, if you click on the plus-sign at the right of the feed item, you will see more choices. Depending on the item, the menu allows you to add comments, view the existing comments for the feed item, report an issue to the HubPages staff, share the item with those following you on the feed, or indicate that you like an item. You can quickly tell if you have any comments or fan mail to moderate or any requests. 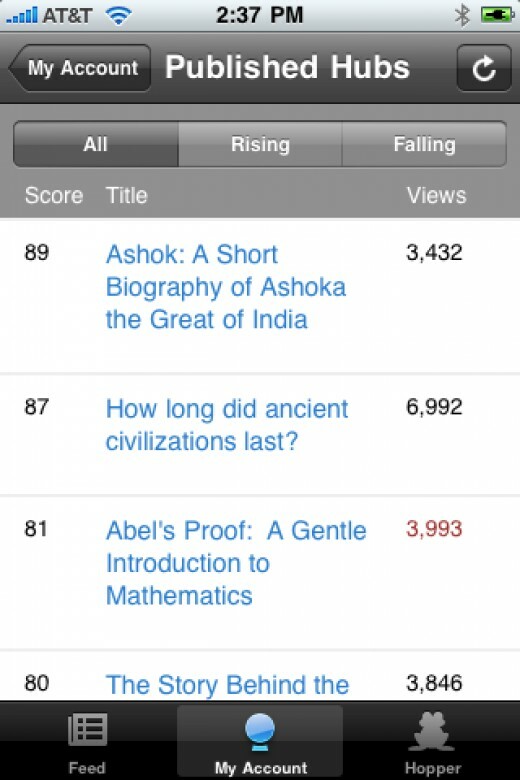 A red number on the tab tells you how many items that have not yet been reviewed. The “Hubs” menu item allows you to see the latest stats on your published hubs. 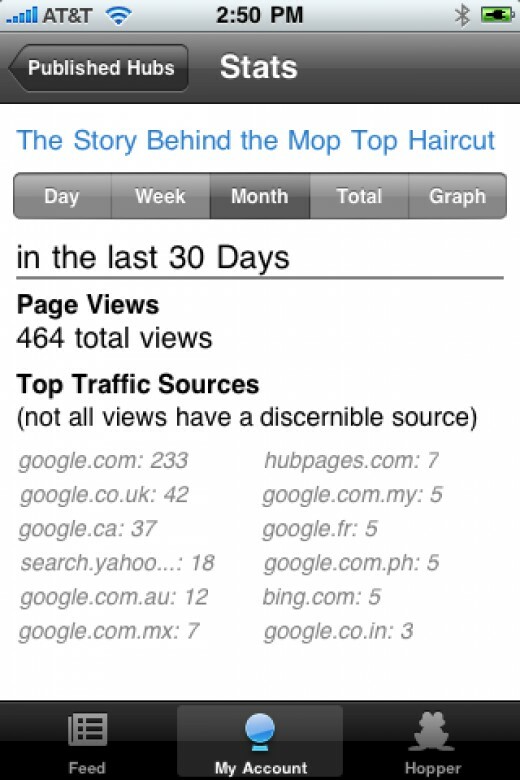 You can sort by score, title, and views and you can filter the list by rising or falling traffic. If you click on the hub’s title, you go to a Hub Detail Page that allows you to see the daily, weekly, monthly, total stats, and a graph. The Hub Hopper allows you check out recently published hubs. The hopper will automatically focus on categories and hubbers that you are following. We are now in the process of planning of the next release of our iPhone application. 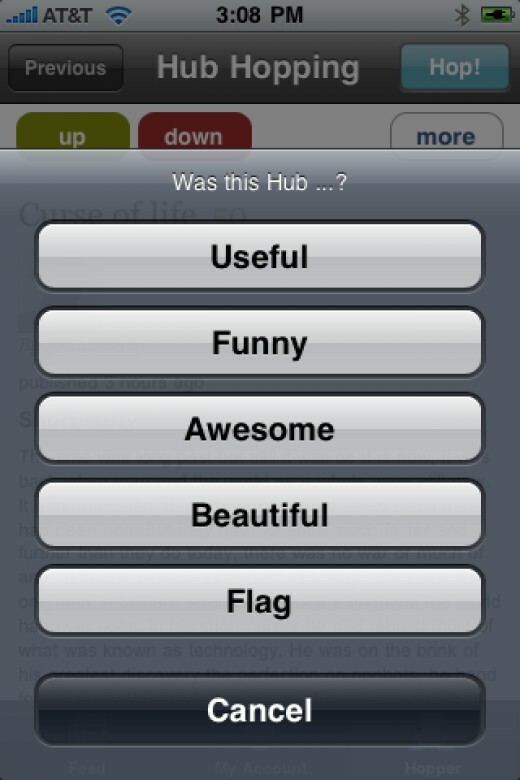 Android Support: We are planning a HubPages mobile app for Android. Hub Tool Lite: it should be easy to write simple hubs that conist of text and images only. More Notifications: Notifications when a user responds to a forum post or a question asked, etc. If you have any suggestions for what you would like to see, please let us know. Feel free to request a feature here or to provide a comment to this blog post. Eat, Drink, and Be Hubbalicious: the June contest! Hope you’re hungry this month. Food is the topic of this month’s contest—the Eat, Drink, and Be Hubbalicious Contest—and we hope talented participants’ Hubs on the world of cooking techniques and ingredients, and the cuisines of the world and their recipes, will get visitors’ mouths watering and stomachs rumbling for years to come! Come one, come all, to the Food category page for details on the contest. There’s over $3,000 in prizes still up for grabs, and people from over 100 countries are eligible.